breeding farm with several stallions. information. Click on the word of the folder you want to work on and it comes to the front. 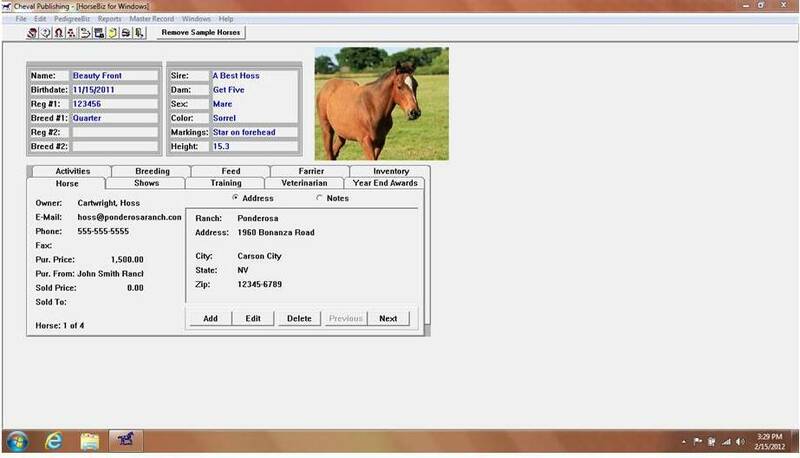 It's fast and easy, you shouldn't have to move to different windows to work on your horse records. Our extensive on-line Help system will take you through HorseBiz, but we bet that you won't even have to use it! We even have a built-in web browser, so you can go directly to our homepage if you have questions or need help. addition to HorseBiz. 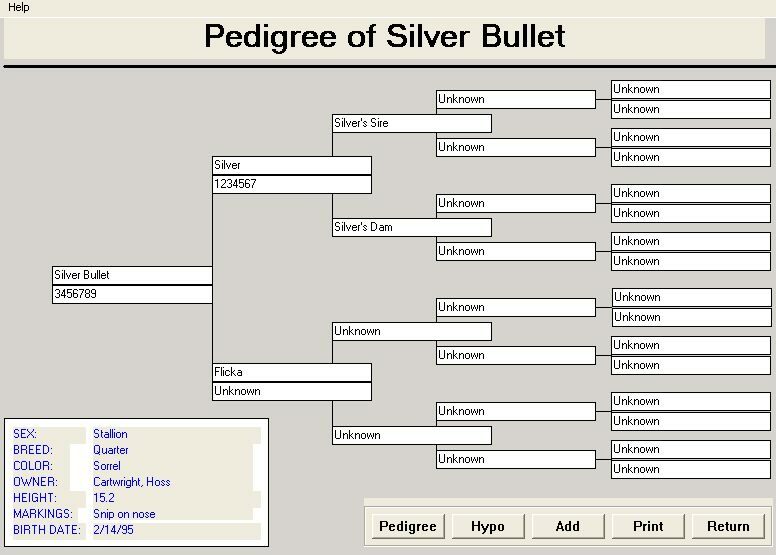 Once the user has entered a horse’s pedigree, it is there to select "on the fly" in any horse’s pedigree – no retyping! Each horse is automatically linked to other horse’s in its pedigree, highlighting any horse that appears more than once in a pedigree. Using this folder you will be able to keep track of outside mares being bred, stallions being stood or sending a mare out for breeding. You may only enter breeding records for stallions or mares, of ourse! Track mares and their breeding dates, foaling dates, and expenses. Click on the Events button to record the results of an event for a specific horse at this show. The Veterinarian sections allows you to take all vet information. It allows you to set due dates for the next visit. The Year End Awards folder is used for recording Year End Awards information for an individual horse. trail rides, clinics, breed programs and more.